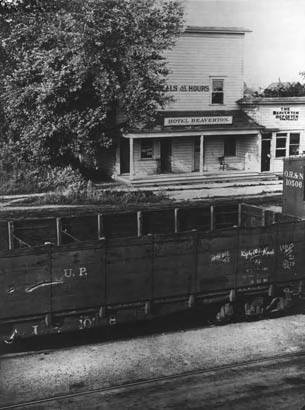 The two-story Hotel Beaverton and Beaverton Reporter were located on Farmington Road and Washington Street, east of Watson Avenue and across (south) from the train depot. Construction date has been tentatively identified as the 1880s. George Thyng owned the hotel about 1907 and sold it by 1910. This building was later known as the Commercial Hotel that was owned and operated by the Merlo family. An early address was 103 SW Farmington Road. The building was extensively renovated and later converted into apartments. It was torn down circa 1969.